Roasting Lamb Shoulder in our Beehive Oven: This was only possible due to horrendous weather conditions in East Yorkshire after a traumatic but successful attempt to move the oven under cover, so that no matter what the weather throws at us in the future, I can cook in it to my heart’s content. On Sunday, a few weeks ago, the early morning misty sun gave us a hint of just maybe a better day, weatherwise. Erik and myself put on our ‘gardening’ clothes with the intention of having a ‘serious’ gardening day (weather permitting). But Erik didn’t realize what was about to hit him. It was all my fault, really. I’m not sure if it’s just a women thing, but I like to change the garden round in the same way I change the furniture in the lounge. I know better than to ask Erik (men aren’t into these things) so when he was busy on the Friday, I decided to not say anything but just quietly get on with it and move the garden tables and chairs and planters and …… just about everything …… in every direction until I was satisfied. (He didn’t even notice.) I’m a dab hand with the sack barrow as well. Then I suddenly came up with the (I think) brilliant idea of moving our wood-fired outdoor oven to a place where I could cook with it, whatever the weather, under our outdoor tent/pergola, only a matter of 20 feet, uphill and through thick gravel!! So on that Sunday morning, I nervously put this to Erik. Bless him, he didn’t argue. His only words were “What? Today?” I nodded. But in between the sudden heavy showers and minutes of sunshine, we did it, and although it was difficult, we were quite surprised that we actually managed it without screaming at each other or dropping the terracotta oven from its stand. We had a few heated discussions about where its final destination would be under cover – which way the smoke would go – how close it could be to the tent – and then it was sorted. Now that we had moved the Beehive oven under cover, I was determined to cook the evening meal in it, whatever the weather. The day before, Erik had bought a shoulder of lamb, and trawling through recipes for use with a ‘Wood Fired Oven’ I had found a great one for shoulder of lamb, which involved marinating it overnight in a paste made from Red wine, Olive Oil, Garlic, Rosemary and Thyme. The aroma in the kitchen was incredible. I decided to cook the Lamb Shoulder on a bed of quartered onions and springs of Rosemary, in a Tierra Negra roasting dish that is perfect to use in such as a Wood Fired oven. (Click here for details of Tierra Negra cookware). I also decided to cook one of our favourite recipes, Greek Lemony Potatoes, to go with the Lamb. And good fortune shone on us as the weather cleared up mid-afternoon, so we lit up the oven. 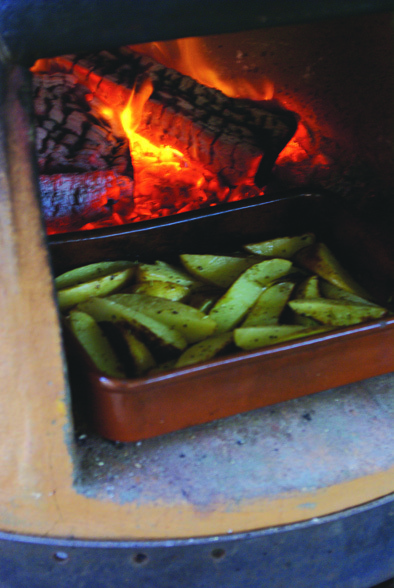 If you’ve read my other articles on the Wood-fired Oven (also called Beehive or Pizza or Terracotta oven), you will know that once lit, the oven has to get very hot, then depending on what dishes you are cooking, you either keep adding a log quite often to keep up the temperature, or you allow it to gradually get cooler, and add a log every so often just to keep it going. I started roasting the Lamb Shoulder on the iron trivet, as seen in the picture at the very top. The flames were licking up the back of the oven wall, into the center, with the ashes gradually going grey. Then after about 15 minutes, I transferred the dish to the floor at the front of the oven, a cooler heat, to carry on cooking (see below). Not long after, I covered the dish loosely with strong foil. Depending on the size of the joint, and the heat of the oven, this dish can be left to cook for 4 – 5 hours, so that is falling apart and so incredibly tasty. The temperature in our Beehive Oven can reach as high as 750 degrees F, but as you let the heat decrease, the ideal heat for roasting joints is when the oven has reached approximately 550 degrees F /300 degrees C. But some huge joints can be left in overnight (or all day) to cook in the residual heat of the oven. Very important: make sure your thermometer is heat-proof. I’m hoping to get a Laser thermometer one day so that I can just point at the oven to find out the correct temperature. The next step was preparing the Greek Lemony Potatoes. I’m not sure where I found this recipe, but it’s one of our favourites. It goes so well with Lamb, Chicken and Pork, and can be started off in an ordinary oven then finished off in the Wood-Fired oven to crisp up the potatoes and give them that special flavour, or cooked totally in the Wood-Fired oven if you wish. Which I did (see picture below). The potatoes are cut in extra large chip chunks, and I prefer the peel left on, then mixed with olive oil, Oregano, Rosemary and Garlic, Lemon Zest plus juice and just taste gorgeous. Click here for the Recipe for Greek Lemony Potatoes. Our meal was incredible. Roasting Lamb Shoulder in our Beehive Oven was a perfect way to cook it. It was so succulent, and literally fell to pieces when we touched it, so full of wonderful flavour. The Greek Lemony Potatoes crisped up, and after absorbing all the liquids and herb flavours tasted just superb. To keep up the Greek food theme, I also cooked some Aubergine slices, topped with slices of Beefsteak Tomatoes and scattered with Buffalo Mozzarella which melted in the residual heat of the Beehive Oven. What a great meal we had, and hopefully, now the Oven is under cover, we will have many more to come. Please could you tell me where you got this oven from? It is just what I am looking for! If it is my beehive terracotta oven, it was about 7 years ago from a company called ‘Blistering’. The link is on the right hand side of my home page. The other oven is from The Stone Bake Oven Company – the link is on the post entitled “Anyone fancy a wood-fired oven” that I posted this morning.